This season I am going to try growing our potatoes in oak barrel halves. I am doing this for two reasons; it’ll save raised bed garden space for other crops and it will eliminate the need to dig up the soil environment when harvesting the potatoes. I also want to try an experiment with potato toppings. No, not sour cream, bacon and chives (that’s later in the season). I am going to cover the seed potatoes in one oak barrel with organic garden soil and other seed potatoes are going to be covered in straw. I read the potato-straw-mulch idea in Organic Gardening’s newsletter. To get started, I drilled three 1 inch holes in the bottom of my half oak barrels. I then added medium sized rocks around the holes. Over top of the medium sized rocks, I placed larger rocks to form a bit of a bridge. 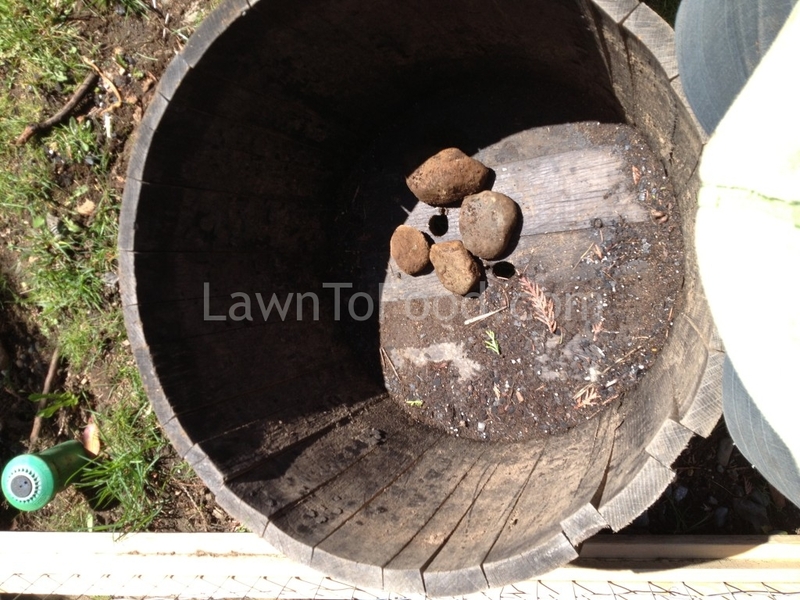 The rocks will allow excess water to escape while preventing the soil from clogging the drain holes. I added about 4 or 5 good shovels full of sandy, but rich, organic soil from my backyard. 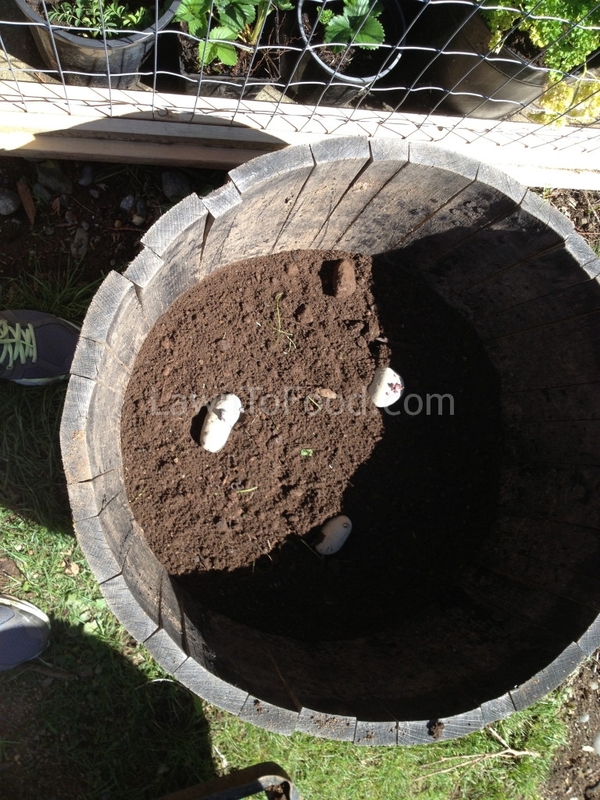 Then I placed 7 seed potatoes on top of the soil … which was ridiculous! I edited that down to 3 seed potatoes and that is still probably too many. I have to remember how large plants will grow if they have ample space to do so. 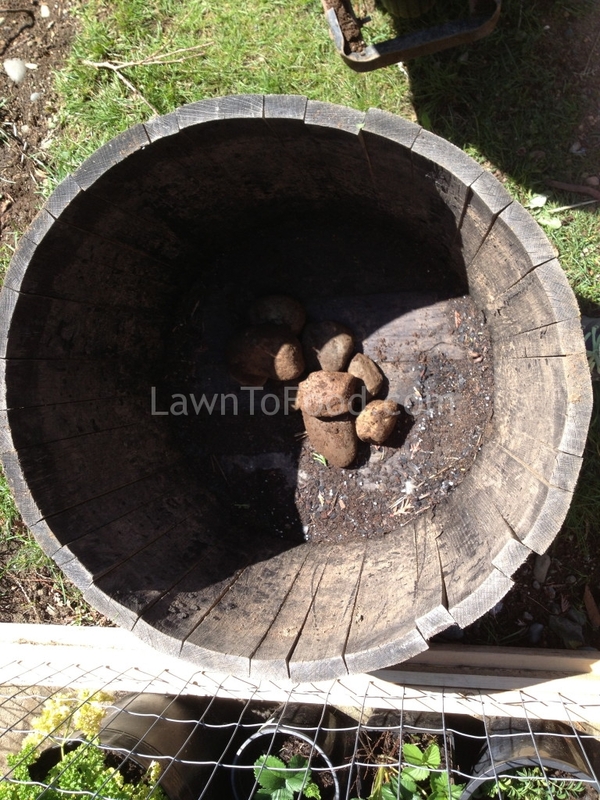 I covered the potatoes with 2″ more soil and watered them thoroughly. I repeated the process for oak barrel number 2, including the soil on the bottom. The difference is that I covered the potatoes in barrel number 2 with straw, instead of soil. Every time the potato plants grow 4″ to 6″ tall, I will “hill or mound” them with either more soil or more straw. I am curious to see which oak barrel produces more potatoes. I’m also wondering if I’ll be able to harvest clean, non-dirt covered potatoes from the straw barrel. How are you going to grow potatoes? This entry was posted in Containers & Small Spaces, Crop Planning, Growing Food and tagged barrel, containers, potato, straw by Lynda. Bookmark the permalink.